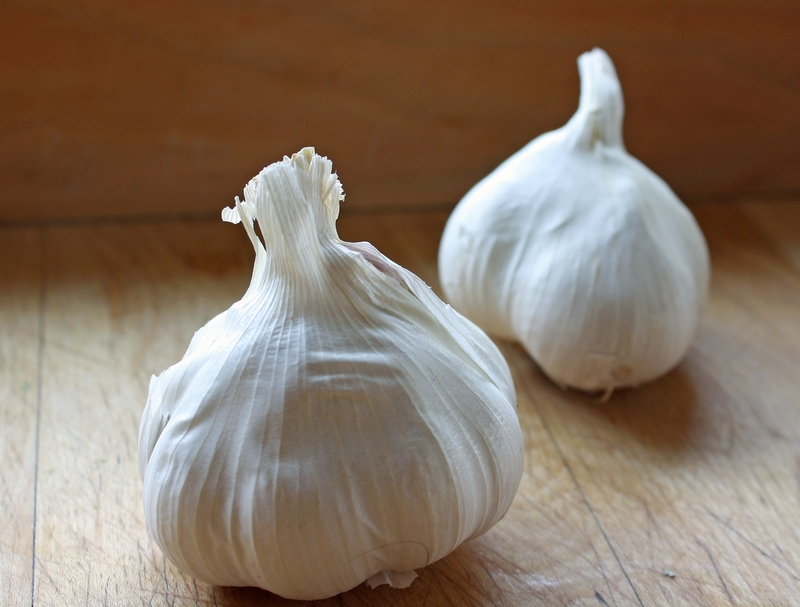 Instead of a recipe today, I am going to share with you a little known cooking tip to help increase the health benefits of garlic. When you use garlic in cooking, after mincing or crushing it, you should let it rest at least 10 minutes before using it. This helps to release certain compounds namely Allicin, the cancer fighting, antibacterial compound we get from eating garlic. It actually is a chemical reaction of two compounds Alliinase (an enzyme) and Alliin, which when released by mincing or crushing, turn into Allicin. It takes several minutes to transform but, it is well worth the wait for our potential health benefits. So include garlic in as much of your cooking as possible. Mince or crush it first and let it rest while you prepare the other ingredients for your dish. Read more about it HERE and HERE. On another note, as you may recall, my New Years resolution was to try something new each month. Well I’m here to tell you I will not disappoint this month (April). Drumroll please…..my new thing this month was to buy 3 little pigs and raise my own bacon. Believe me this decision did not come easily, as I find pigs to be really cool and fun animals. But I do love all things pork and find it really important when I eat it, for it to be of the highest standard (a pastured, well fed, happy pig). I also think it will be a really good learning experience for my girls to see how and where their meat comes from. They already have been exposed to this as my husband is a hunter and processes his own game. We also took on raising our own meat birds last year, but the more exposure the better in my book. Excuse my delay getting this Easter post to you. I can assure you these macaroons are good for any occasion. We have a tradition of doing an Easter Egg Hunt and Brunch every year on Easter Sunday. Last year we happened to be out of town for Easter, but my oldest daughter would not stand to miss the brunch and hunt, so we had one in May. We are strong on tradition here at Hillbilly haven. This year we had a great group of friends join us in the snow, which didn’t slow the egg hunters down one bit. We had an array of delicious food to share and these macaroons were a tasty treat to add to the mix. They are especially delectable if you are partial to chocolate and coconut together, think Mounds candy bars. I found this gem of a recipe in Mediterranean Paleo Cooking, check it out HERE. This book is chock full of gorgeous photos and tasty recipes. 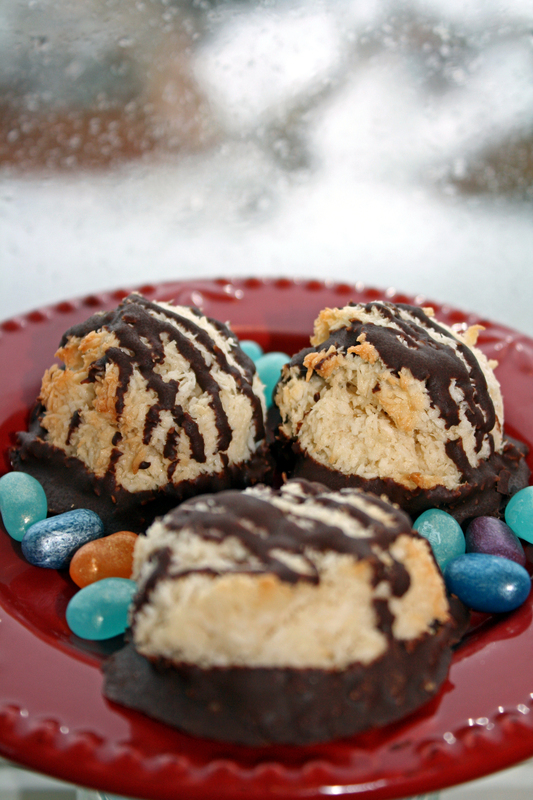 The macaroons are simple and easy and just the right amount of sweetness to satisfy the tooth, the sweet tooth that is. 1. Preheat the oven to 325* F. Line a baking sheet with some parchment paper. 2. Whip the egg whites until they form medium-firm peaks. 3. Whisk in the vanilla and salt. Slowly whisk in the sweetener a little at a time until it is all incorporated. 4. Fold the coconut into the egg white mixture, being careful not to stir too hard so as to lose your volume. 5. Bake the cookies for 15 minutes or until they are golden brown. Let cool on a rack.